Bologna is known as "il rosso": the “red city”, partly because it is actually red in colour; built of brick rather than marble, with even modern buildings often being plastered in red stucco. The other reason is that it was traditionally run by the Communist party: I found the party newspaper being sold on the streets even today. Ever since the Renaissance this region of Italy, the Emilia-Romagna, was part of the Papal States, ruled from Rome; it rebelled unsuccessfully in 1848, and the Pope’s troops were only expelled when Italy was unified in1861. The city was damaged by Allied bombing in the Second World War, but was rebuilt in the traditional style, and the centre is still a tangle of mediaeval buildings and confusing little streets. These are views from the campanile tower of S. Petrino church on the Piazza Maggiore; the heart of the old city. The redness of the old city is very clear, but note the spectacular towers: some of half-a-dozen remaining from the Middle Ages. Reaching the top of the tallest one, the Asinelli Tower, involves climbing almost 500 steps, and I’m afraid I chickened out of making the attempt. Near the towers are the old Jewish quarter and the student quarter. Bologna boasts of having one of the most ancient universities in Europe, though some other Italian cities dispute this priority. 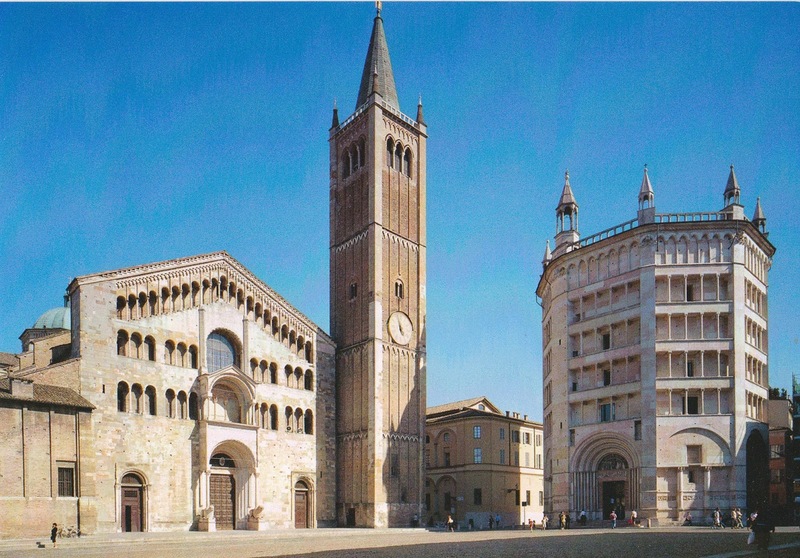 Everyone assumes S. Petrino is the cathedral of Bologna, but it isn’t. Its unfinished state is very noticeable. though unfortunately the famous statue of Neptune was surrounded in scaffolding on our visit. Pilate’s courtyard (complete with a basin for washing his hands) and a Column of the Flagellation, in black marble. All this was built from the 5th century onwards, in a praiseworthy attempt to save the pious the trouble and expense of having to make a pilgrimage all the way to Jerusalem to see the real things! I also visited the town's mediaeval museum, but there was far too much to see in a single visit, and unfortunately no photographs were allowed. Bologna is also known as the “fat city”, since its cuisine is said to be the best in Italy. Our guide (a very nice young lady called Antonia) impressed on us that we should never, under any circumstances, ask for spaghetti bolognese in the city, this being essentially an American invention. What the locals eat is actually tagliatelli with a ragu sauce which, because it contains few if any tomatoes, is brown rather than red in colour. Local delicacies include rabbit stuffed with figs (“coniglio”: which is very tasty!) and a particular kind of veal cutlet with Parma ham and parmesan cheese. Certainly Bologna seemed full of good-looking restaurants; which made the sight of large queues at the local McDonald’s a particularly depressing spectacle. Our hotel, which I would recommend, was the Internazionale on the Via Indipendenza: a wide boulevard driven from the railway station straight to the heart of the old city. It was only a short walk to the Piazza Maggiore, and impossible to get lost on the way. My window looked out on the entrance to a large park, and in the early morning the sky was full of swifts. But on Friday the streets opposite were taken over by a vast market, where many of the stalls featured great piles of cheap clothes: rummage for what you can find at 2 or 3 euros! Many of the stallholders were Asians. The streets in the centre had numerous beggars: a variety of cripples and defeated-looking old men and women, but also lots of young African men, who appeared to speak no Italian and just stood around mutely holding out baseball caps for contributions. Who were they? Refugees who had fled across the sea from Libya, perhaps? On the Thursday we were taken on a guided tour of Parma. Unlike Bologna, this was an independent little Duchy ruled by the Farnese family. They owed their wealth and prominence to the shameless nepotism of one Alexander Farnese, who in the 16th century became Pope Paul III and dedicated himself to the wellbeing of his family. It was the Pope’s grandson, Alexander Farnese, Duke of Parma, the greatest soldier of his age, who in 1588 was supposed to lead his army across from Flanders on the Spanish Armada, but famously failed to do so. In the 18th century the British government went to enormous trouble to have Don Carlos, the son of Elizabeth Farnese the Queen of Spain, made Duke of Parma without causing a diplomatic crisis. (Don Carlos later became King of Spain himself, when with base ingratitude he took Spain into the Seven Years’ War against Britain – not that it did his country any good). When the map of Europe was redrawn after the battle of Waterloo, Parma was given to Napoleon’s widow, Marie Louise from the great Habsburg family, since no-one could think of what else to do with her. We entered Parma through the vast bulk of the Farnese palace. Between the wars it was the headquarters of the local Fascist Party, and was then badly damaged in wartime bombing, but has been restored. In front of the palace was a large area of grass, which included a random-looking collection of objects which were apparently an art installation. There was also a statue of a young anti-fascist partisan fighter, who was contemptuously turning his back on the palace. The centre of the old town was just a short walk away: a piazza fronted by the cathedral, the baptistery and the episcopal palace. This picture is taken from a postcard, because at our visit the area was full of thousands of small children celebrating the start of their summer holidays, being organised and addressed by a DJ on a disco system at maximum volume. Our guide abandoned her talk and we elbowed our way through the dense crowds. and a magnificent dome painted by Correggio in 1530.
and inside, the walls and dome covered with mediaeval frescoes. We could have done with more time to explore Parma, but instead we were whisked away to encounter local foodstuffs. First we were taken to what can only be called a factory producing Parma ham. We were shown literally thousands of pigs’ hind legs, hanging up to mature in near-freezing conditions (50,000 a year were processed, we were told); the man in charge explaining to us how he pricked them regularly with a large needle made from a horse’s tibia bone, and then sniffed to make sure they were up to standard. Then it was on to Modena, where the mysteries of making balsamic vinegar were explained to us. This bears no relation at all to what we buy in the supermarkets, and since it takes 12 years to mature (25 years for the best quality) it is incredibly expensive. Although it did indeed taste very nice, I didn’t buy any. Incidentally, despite this being a rich farming region, we didn't see a single cow or pig. They are all kept indoors for the whole of their lives! The next day we were taken on a tour of Ravenna, but there’s so much to say about this that I’m leaving it for my next blog post.